After a week or so of pretty much only drinking wine (or Port), it was time to switch things up. In all my times in Spain -- from living there to visiting -- I can't remember good beer being much of a choice. There were maybe one or two national brands available (depending where you were), and they weren't all that great. So, to say Spain isn't known for beer is an understatement. But beer is what we (or perhaps just I) were craving, and beer we needed to find. Luckily, times in Spain they are a'changin'. Much like in other parts of the world (or at least here in San Francisco), there is a surge in beer popularity, craft beer in particular. So I took a chance and did a little googling to see what I could find while in Madrid, crossing my fingers that there would be something, and not too far from our place. And the finger crossing paid off! We came up upon Fabrica Maravillas, located not too far from our place in the Malasana neighborhood. This modern space is where the beer is actually brewed -- as evidenced by the clear casings showing off the tanks. It is modern while still being comfortable, and has a serious neighborhood vibe to it. We arrived just moments before the placed started filling up, and found ourselves a space at the bar. When we arrived, they had perhaps five beers on tap. There are three different sizes to choose from -- a taster, half pint, and full pint. This is one approach I see very rarely in the States but really appreciate those choices when you just don't want to commit to a full glass. I started with a half pint of the Weitbeir (spelling incorrect, I know), which was very traditional and tasty. My friends had the Saison -- that is not my favorite style in general, but this was a good variation of it. Next I moved to the FL(ipa), which was a pretty nice IPA. 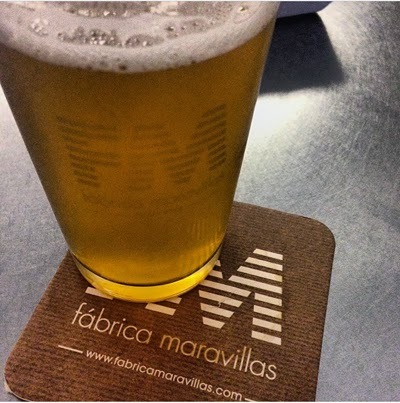 I also had the Malasana, a pale ale named for the neighborhood occupied by Fabrica Maravillas. This was my favorite of all of them -- lucky for me this was also one of two beers they had actually bottled! We liked this place so much we returned the next night just to taste (or heavily drink, depending on how you look at it) again. Thankfully for us, the staff speaks English so we could ask a question or two before the place got too crowded (and be warned, it does get crowded). With each drink, you'll get a bowlful of Spanish green olives or a snack mix. But that is the extent of the food they serve there. But if you want to escape the tourist trail and hang out with some locals and drink some good beer...this is your place! Fabrica Maravillas is located at Calle Valverde 29 in Madrid.